California Caster offers Swivel-EAZ split-tread steam cleaning and wash-down casters made from solid polyurethane and precision ball bearings. For food, FDA, semiconductor, pharmaceutical, automotive, and medical equipment. Precision ball bearings are designed for steam cleaning and wash-down applications or where excessive water or liquid is present. The split-tread wheel has independent swivel surfaces which significantly reduce rolling resistance, minimize initial start force, and result in a 35-50% reduction in push/pull forces. These wheels come in a variety of durometers to match your needs. Ideal for semiconductor, pharmaceutical, automotive, and medical equipment, as well as many other applications. 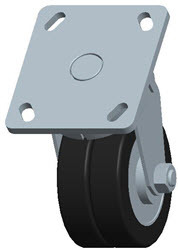 Many of our Swivel-Eaz Casters have 3D Models available for download in most formats, including IGES, STEP, PRO/E, and SolidWorks.